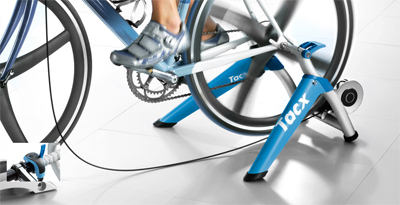 The Tacx Satori Smart trainer uses complex technology to measure your speed, cadence/s&s/power. This data can then be displayed on either a Tablet, Smartphone, or similar device. The Satori is suitable for simple training sessions or endurance training. The Satori Smart is a Turbo trainer with a built in wireless technology that reads Speed, Cadence and Power. This can be read by all types of third party hardware offering the rider unparalelled accesses to technology that will enable the chance to track, monitor and improve performance with each ride. Use the Satori Smart trainer during the cold Winter months, miserable and wet days, all year round training and testing. No mains operation meaning it's battery operated and ideal if warming up is critical before competition or cooling down is required after an event. You can use this trainer either by (1) ride using third party hardware and software to monitor performance (2) ride without connecting to third party hardware and instead use the 10 levels of resistance as standard. 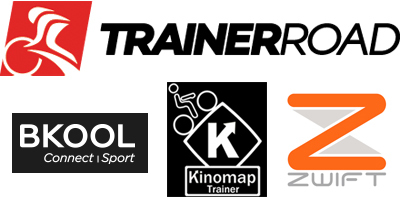 The Satori Smart Trainer is compatible with various open third party software platforms, as well as the free Tacx software, that will help and make your training session much more fun and realistic.